Way back on the 8th of May, I was recovering from a nasty infection and suggested to my mother, with whom I was staying, that we go for a drive, to get me out the house and into some fresh air. It had been hot during the last couple of days but the weather had begun to cool and the clear blue of the sky was studded with swift moving clouds. We drove south and then took a country road westward through Hampshire farmland, until we reached a small sign which announced that we were passing into Wiltshire. We turned the car around and returned to a small village, quiet on this mid-week day, its ancient thatched cottages, empty; their occupants doubtless having little to do with country life, would be working in the city and would not return until perhaps 8pm, their commute a flustered mix of heavy traffic and Radio 4 comedy. For now, the village was silent, unmoving. We stopped at the pub, now heavily reliant on passing trade and its inventive culinary offerings. It was a quiet day for them so far and my mother and I were its only customers. I ordered a half of ale and a vodka & tonic and chatted with the publican and her husband before joining my mother outside. They were a young couple, enthusiastic and attractive as a pair. There is a myth that the English can be unfriendly and that the rural English in particular can be introverted and outwardly hostile to strangers. But this has not been my experience. On the contrary, Hampshire people often seem to portray a sort of friendly, naïve solicitousness, as though every stranger is merely a dear friend as yet unknown. This couple carried some of this air about them and I liked them immensely for it. Little things make big impressions sometimes and the way her husband took a cloth and wiped the glass before pouring my beer displayed a sort of care and attention to detail I appreciated. It would be wrong to say that this couple embodied the village. For all I know they came from a totally different part of the country. And whatever timelessness the uneven walls and thatched cottages appeared to evoke, the fact is that this village can only ever occupy the present, while hinting at the past. And, yet, no person occupies a present without standing on ground occupied by the ghosts of their ancestors. And just as this couple stood, by their youth and their spoken voice for an indefatigable present, so in their decency and care, did they stand for a value system which this village has known for many hundreds of years. What to a Frenchman or an American (or a Scot such as myself) might appear to be a reserved or dryly undemonstrative reserve is often simply intended as polite decency and we would do well to remember that a showy, self-aggrandizing approach can be used to disguise the absence of deeper or finer sentiments. As the truism goes, often a man who finds it hard to say I love you, is less likely to say it to those whom he has no business loving. Of course, it is easy to be romantic about so beautiful a place, where only the tarmac and television aerials hint that this place has evolved beyond the time when it might have been painted by Constable. Indeed, that evocative connection with history is exactly what has dragged this place into the 21st century in the first place. It’s properties, conceived as the simple dwellings of farmers and their labourers are today valued in the Millions and its inhabitants are no more connected to the surrounding farmland than I am. The same beauty which encouraged my mother and I to stop here for a short time is exactly that which drives the determinately modern to leave their offices in London and spend 2 hours travelling home each night while that tarmac road is what has allowed the modern residents to contemplate such an epic twice daily journey. Even yet, in winter most of the inhabitants of this Village will not even see its beauty except at weekends, leaving before daylight and returning long after the sun has crossed the Atlantic in its own pursuit of the New World. Whatever accents and voices this place once spawned long ago left this place, taking with them much of the sense of continuity and permanence that it stands for. Yet the country folk who built this place did not take everything with them. For the appeal of places like this lie not in their buildings as such, for all that they are breathtakingly pretty and romantic. Rather, the reason people spend vast fortunes and make huge sacrifices to call this place home is because of what it represents. And what it represents is something hard to realize in simple, corporeal terms. This is the heart of what we imagine England to be, rural, simple, peaceful, prosperous and contented. This is a dream England complete with well-kept warm beer, a flint Norman church with reformation white washed interior and modest war memorial sitting beside a village green upon which cricket is played. To call this village home is to be able to state confidently that you associate and perhaps even belong to the continuity and simple happiness of Englishness. This slice of belonging might come at a price and that price might hint that you also belong to a slightly less idealistic English present, but that price remains worth paying. Who would not want to live here; settle with a loved one on a weekend morning and share marmalade and toast under a chintzy bedspread, raise children to attend a village school and enjoy pub lunches and church fetes and walks on the rolling hills above? Who would not pay over the odds for such certainty and such a feeling of place in so long and illustrious a national narrative? Even the recent history of this place is richly evocative and enticing. Who would resist the chance to drive an open-top roadster through the single lane country roads and capture the illusions of speed and freedom that such a journey represents? Who could fail to evoke, as I did while waiting for my change, the ghosts of 1940’s GI’s billeted nearby, young men from very different farmland in Minnesota, Idaho and the Dakota’s, bragging and playing darts and sharing Camel Cigarettes with local girls in floral dresses? Who could fail to be moved by the lives of these girls; whose coming of age took place at so vital a time and whose glimpse of such modernity would fundamentally alter the course of their own lives and would see them leave this place for the places country people go, taking with them the continuity of family association that had lasted for hundreds of years? Given such imagining, who would fail to congratulate themselves at so cheaply bought a place in the continuing story of rural England and yet congratulate themselves on having secured such accessibility to the unending whirr of London? Of course it is easy to disparage the ideas that hedge fund managers and stock brokers can buy a slice of England and with it a sense of owning a stake in her history and essence. These people ultimately belong to a very different, perhaps competing version of England, one where gentleness and continuity are absent and where fast paced decisions taken with ruthless devotion to financial gain take precedence over contemplative or moral considerations. How can I seriously think that by robbing these places of their rural inheritance and turning them into soulless weekend playgrounds for the obscenely rich, these people have established a legitimate claim to the soul of the nation? A soul, we know, dimly recalling Sunday School and Christopher Marlow, cannot be bought so cheaply, not without consequences. If these places stand for any version of England, it is surely not one where the rich toil in gym’s rather than in fields, consume French mineral water rather than mead and obsess about asset portfolios rather than the New Testament. Like the buildings these people occupy during the day time, they are artificial and impermanent, turning cold grey mirrors out upon the world, obscuring the hidden shallows within. It offends our collective moral sensibilities to imagine that such people not only inhabit the best London and New York have to offer but also colonize England’s collective continuous memory as well and rob it of its reality and reason for being. But it offends our collective aesthetic sensibilities as well. That the owners of such desirable village properties care so little for the world they have purchased and dissembled that they will sacrifice the local vitality of the place simply to own it, compounds a sense of deep injustice. 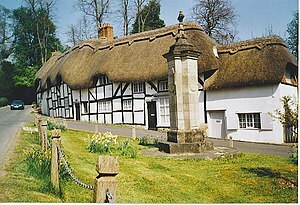 Conservatively, we, the majority who fancy that we have a deeper understanding of the value of such a place than the mere commercial value of a pleasant rural setting, are doubly offended that the people who own this village care so little about its purpose or essence and possible fail to grasp that it has either. And looking out at this empty village with its odd, forbidding silence, it is easy to see the point underpinning such resentment. The Village has been colonized, its inhabitants moved on and in their place remains merely a reflection of the people who now own this place, people who have no intrinsic sentimentality or empathetic feel for it. And yet, while I understand this image of dystopic England, a sort of Invasion of the Body snatchers with a country burr, I cannot feel it. In the silence of this place I feel the presence of those who came before and were undeniably of this place. And among that number I count the young men who came from across the Ocean and who would soon be ship bound for France. I count the bored adolescents on the threshold of the adult world, to whom the narrow confines of a horizon of fields was a barrier between them and the movement and vitality of the cities beyond. I count the generations who would have felt the stifling social conventions of so small a place and the many who would have passed through this place without ever giving it a second backward glance. This village was their England too and though it is gone, it is no less valid than that embodied by contented old men sucking straw and chewing the fat on either side of a wooden style. And something else nags at me. In my experience of the men and women of London’s Financial Services Industry, there is a general absence of sentiment. A second cousin of mine once stared in frank bafflement at my quotation of Robert Burns to illustrate a point. He is now working in Hong Kong doing something to do with short selling of stock options. It was not that he missed my point or that he did not get the relevance of Burns to it. Rather, he seemed to be surprised that anyone still spoke in such terms. The modern world is no place for the contemplatively assembled wisdom of dead poets. It is there to be conquered and exploited and owned and traded. Yet while I have no doubt that he unselfconsciously thought slightly disparagingly of me, I misrepresent him if I imagine that he was without manners, or heart or soul. On the contrary, his only real weakness as displayed to me was perhaps too much worldly self-assurance for so callow a man. Patience, was not a word he appeared to value and with its absence perhaps went a respect for the apocryphal wisdom of ages. And here is a thing. For while he was a young man of direction and purpose and self-possession, he also spoke of how much he had enjoyed his school days. Expensively educated and prodigiously gifted at sport, he had been well suited to his classic English Public School and his conversation was seasoned with references to outdoorsy healthiness and a love of competitive sports. I liked him in the slightly patronizing way people sometimes like those they know will one day look down on them, but more importantly, I saw in him and his future success something complete; an ability to be at home and to make the world fit his will. He was not a man destined for the city, but a man destined to treat the country and city as extensions of his own home. And while that is an easy thing to misrepresent and to mock out of jealousy and covetousness, it hints at something we would do well to remember. Money buys things but it cannot buy belonging. That city expats atomize their lives and social circles and treat the village in which my mother and I sat talking, as a country house retreat, and a tradable asset is not surprising and nor is it particularly modern or emblematic of our time. Part of the orderliness and discreet solicitous decency embodied by this place is the result of a simple truth, namely that since the dawn of the Feudal Age, there have been rigidly enforced and yet ephemeral strata’s of society within the country and town alike. This disparity is what has made England what it is and it is what has made this village, for all its idyllic charm, what it is. And what’s more, it is the constant interplay of people connecting this village to the network of towns and cities of Britain, that has given it its security and allowed it to be refreshed and to modernize and incrementally develop apace with the rest of England. Continuity is impossible without change as it leads to stagnation and ultimately revolt. This village embodies England and England embodies evolution precisely because only on the most rare of occasions have its inhabitants faced sudden and dramatic change or schism. My second cousin might one day own a home here in this village. Perhaps he will take his wife and children to the pub in which I sat sipping a half pint and order a ploughman’s lunch or ham, egg and chips. If he does, it is unlikely that he will notice the quietness of an empty village on a Tuesday afternoon. His self-possession will insulate him from that, as will his comfort in his environs, as will his confidence that all he sees before him is part of a world to which he has a right and a stake. And so will continue, the inevitable march of a small corner of a mercantile island, bathed in the cool sunlight of a prosperous age, towards an ever unfolding future. This entry was posted in Architecture, Built Environment, Civilization, Dignity, England, History, Personal recallections, Rural Idyll. Tagged England, Hampshire, History, London, New World, Thatching. Next Post Next post: I am Pale, Male, Stale… and afraid.